An Ultra-Easy, No-Fail Play-Along Session. By Peter Wernick. DVD/Instructional/Folk Instrmt. Play Along. DVD. Homespun #DVDWERSJ21. Published by Homespun (HL.641916). ISBN 1597730955. 5.25x7.5 inches. With Pete Dr. Banjo Wernick. 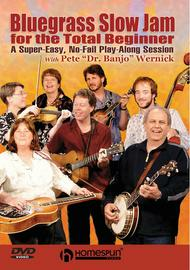 Anyone, with any instrument, can get into this beginner's bluegrass jam session. Seventeen classic songs are played at a slow, easy tempo. Only four basic chords (G, C, D and A) are needed to be able to play along with the band. Includes important tips, advice and encouragement. 125 MIN • ALL LEVELS • INCLUDES LYRICS & CHORDS.